This.Is.SO.Seriously.Delicious!!! You have no idea…. Picture this – easy peasy VEGAN brownie base. – Smothered in a QUICK homemade VEGAN caramel sauce. Are you still with me or are you cleaning up your dribble? 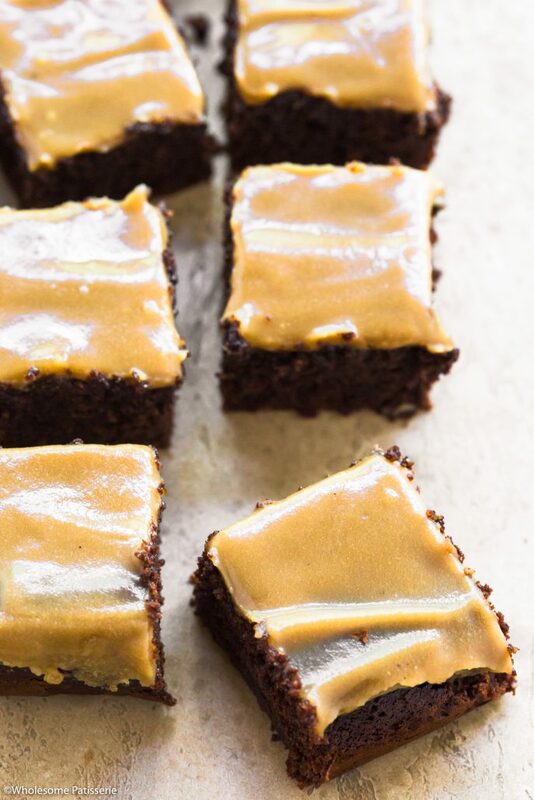 It’s Monday and these Vegan Chocolate Caramel Brownies are exactly what you need in your life, trust me. I made these over the weekend as I had a batch of this caramel sauce sitting in my refrigerator from a client job I worked on last week and had no other use for it. I know, who can not have a use for caramel sauce?? Ironically, me! Until I had a brain wave and a craving for brownies. As usual, I like to get creative and I just can’t keep feeding you random plain chocolate brownie recipes so of course I always have extra creative ideas for these situations. I remembered I had that caramel sauce in my fridge and I really reallyyyy didn’t want it to go mouldy anytime soon. It was actually perfect as I didn’t have to make the caramel sauce again (it was Sunday and Sunday is the day of rest) so that extra step already out of the way was even better! I searched my own website for an easy peasy brownie recipe. It needed to be vegan as the caramel sauce was vegan, you can’t have one and the other you know, especially for a vegan recipe, it’s vegan for a reason! So I found my 30-minute mint chocolate brownie recipe and it was vegan – YAY! I should have already known that but I actually published that recipe early last year. I omitted the peppermint and voila, vegan chocolate fudge brownie base. PS. Do check out my 30-minute chocolate mint brownies, they’re pretty amaze-balls! 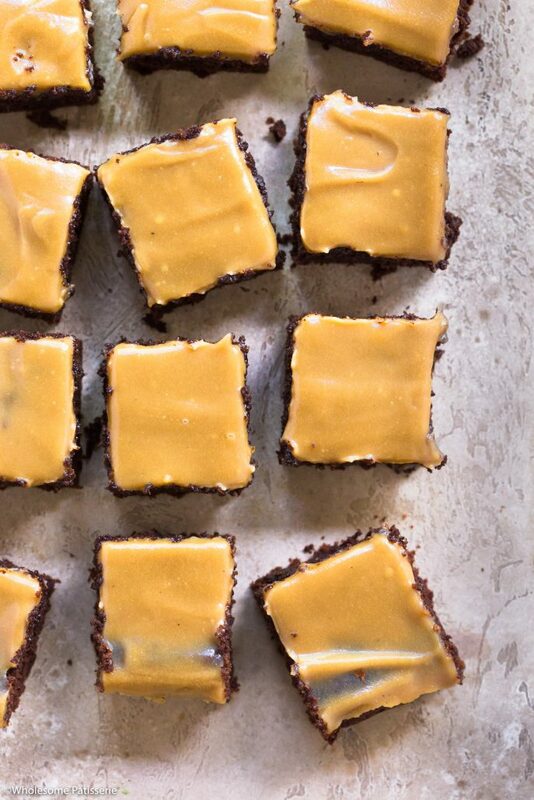 Fast forward and I was photographing these luscious squares of chocolate caramel brownies and taking every opportunity to lick the knife I was cutting the squares with, wouldn’t you? Just by those leftovers from slicing it, it already tasted incredible so I couldn’t have to dig into one. Finished photographing them and it was time, oh my gosh….. DE-LICI-OUS! 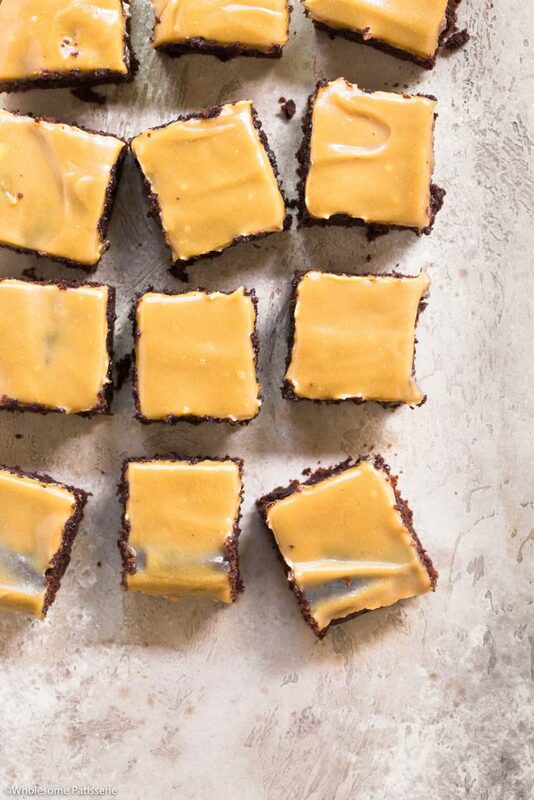 Seriously, you’ll never guess they’re vegan and gluten free…. In a medium sized pot, combine cream, maple syrup, sugar and salt, mix well. Turn the heat to medium/high. Bring mixture to a boil then reduce heat to low and simmering. Simmer for 10 minutes, stirring occasionally to prevent burning. Remove from heat and whisk through vanilla and coconut oil. Whisk vigorously until well blended. Pour caramel into a glass jar such as a mason jar and set in the refrigerator. Once the brownie has cooled down, gently pick it up and place it back into the baking pan. 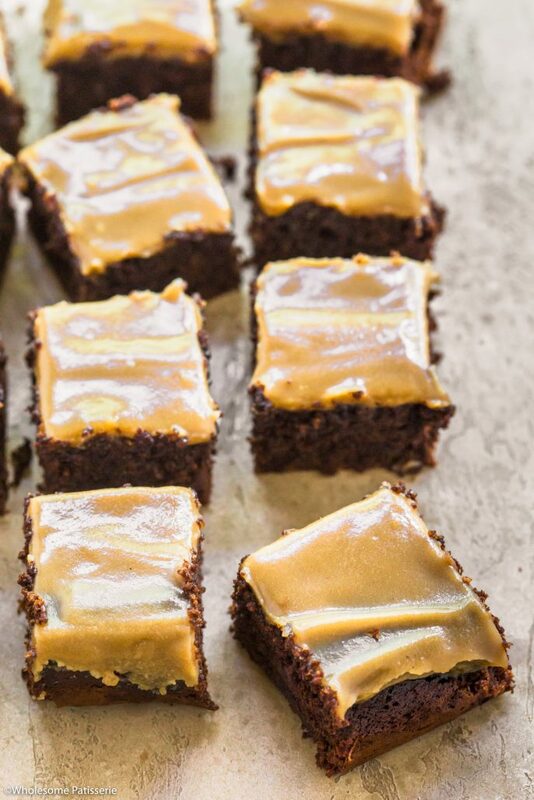 Pour refrigerated caramel over the brownie and spread out the top with a spatula. Refrigerate for 15-20 minutes until cooled and set. NOTE: You can leave the brownie on the wire rack and once cooled, pour over the caramel sauce, instead of transferring it back into the baking pan. This just means the caramel sauce may drip down the edges of the brownie - ain’t nothing wrong with that!